The third-generation Audi TT, coming to Canada in August of 2015 as a 2016 model, marks the first application of the brand’s new virtual cockpit first shown at the Consumer Electronics Show in Las Vegas in January of 2014. On the occasion of the TT’s international launch program in Marbella, Spain, we were introduced to Audi’s new and technically-advanced system by Niko Spachtholz who is responsible for development of onboard systems and online services for the brand. 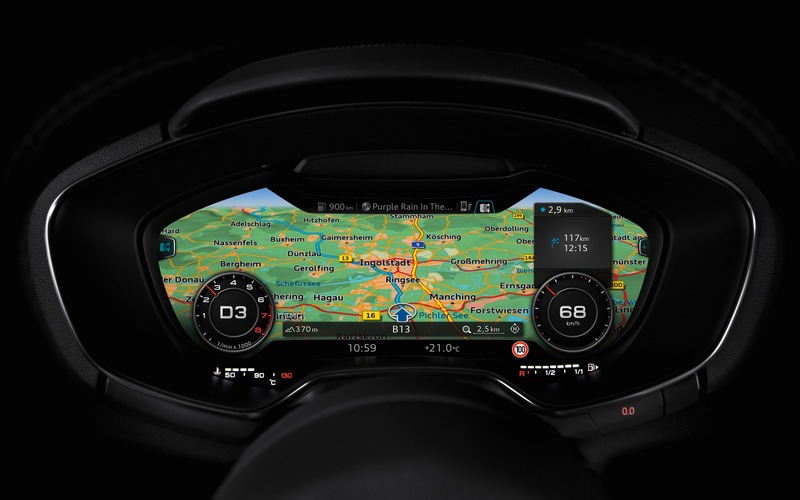 The main interface is, of course, the new 12.3 inch high-resolution display with 1440 by 540 pixels that replaces the traditional gauge cluster. The main processor is a Tegra 30 chip from the Tegra 3 series produced by Nvidia, and Audi is the first carmaker to use this new high-speed graphics processor that works together with a special 3D graphics program to perform more than eight billion computing operations per second. “To put that into context, Neil Armstrong, the Apollo 11 commander who piloted the Eagle LEM down to the lunar surface in July 1969, was working with a computer capable of performing forty thousand operations per second” said Spachtholz. This kind of computing power is one reason why the graphics of the Audi Virtual Cockpit are so clear and sharp. For example, the movement of the virtual tachometer needle is rendered at 60 frames per second, effectively mimicking the smooth and precise sweep of the actual needle in a conventional tachometer. The colors are very vivid and the fonts used for the letters and numbers are very easy to read, even in bright sunlight. While driving the TT, I was able to switch between two viewing modes by using the “View” button on the multifunction steering wheel. In the normal “infotainment” mode, the virtual speedometer and tachometer are superimposed on the left and right of the navigation map. The large surface devoted to the map can also be used to show lists from your smartphone such as contacts or music tracks. It is remarkably easy to follow the route shown by the navigation menu and also quite a bit safer because it is quicker to simply glance down slightly than to have to look down and to the right, as is the case with a conventional screen located in the center stack. Toggling to the “classic” mode sees the middle window shrink as the instruments become larger. Although very much driver-centric, the display can also be used by the front seat passenger and I was able to work the audio and navigation systems as well as my smartphone while riding as co-pilot, even if a small portion of the display is not very visible from the passenger seat. “With this new virtual cockpit, we are able to give our interior designers more freedom to design the interior of the vehicle as they no longer have to contend with a large screen located on the center stack. Of course, with the TT, our display is very much focused on the driver, as this is a sports car, but this display could eventually take other forms in other vehicles as well” said Spachtholz. Audi is innovating with it’s new virtual cockpit and you can bet that other manufacturers will take a long look at this new approach in the future. Before the TT, Audi wasn’t known for its designs. But when the TT Concept was unveiled at the Frankfurt Auto Show, it was a clear sign that a revolution was brewing at the Ingolstadt automaker. With its distinctive Bauhaus style, the first TT quickly became a reference in automotive design.